In Travis Nichols’s new novel The More You Ignore Me the term “wedding crasher” takes on a whole new meaning. The crasher, who never is given a name, doesn’t directly invade, but does so by fanatical, annoying, and increasingly insidious cyberspace shenanigans on the couple’s wedding blog. What starts as a happenstance Internet sighting of a young girl with an uncanny likeness to his mfl (my first love), turns into an ardent, ostensibly delusional campaign to save the bride, Charli, from a lifetime of unhappiness. This hero (hero?) becomes convinced that the moderator of the blog, Chris Novtalis—“a corrupt dribble of afterbirth” and also the future brother-in-law—is determined to have his way with his brother’s future wife. And this is what reading this novel is like—exquisite torture. But who doesn’t enjoy occasional exquisite torture? Formatted like poetic prose, The More You Ignore Me doesn’t follow the traditional formula of exposition, conflict, climax, and resolution. What could have ended up as a tediously long extravagance is saved by “the novel within the novel” as the narrator digresses in to a fully plotted, chapter-headed exposé of his first obsession with his mfl. But still, the end may leave some with moderate indigestion. What Mr. Nichols does brilliantly is examine the inner workings of a delusional and grandiose individual while carefully treading that line of creating a character worth hating and a character almost worthy of empathy. It’s easy to imagine this lonely man hunched over his laptop for hours, sipping cold coffee, and slurping up tasty coffee-pot-made Indian cuisine. “But my dears, any man would feel contempt for you. No man wants to follow a baseball bat. Which is probably quite true, assuming his first statement was accurate, which, of course, it isn’t. 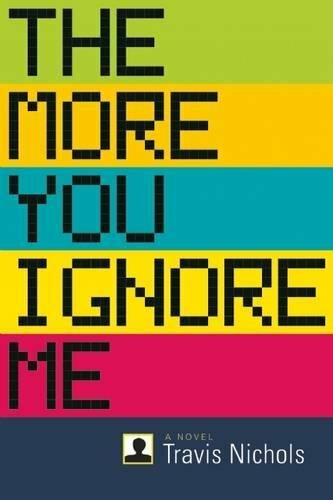 The More You Ignore Me is really a sad commentary on the darker side of the Internet: the disconnect that longs deeply for connection, the disparate cry for acknowledgement. Is anybody really out there that gives a damn? An outlet for thousands of agoraphobic writers, a venue to ease loneliness, a vessel in which to excrete volumes of anger, the total existence for so many individuals—the Internet is a curse and a blessing. It’s so easy to fall into a chair, laptop on lap, stay there, and never fully make the human connection of eye contact. It would appear that Mr. Nichols has little compassion for lost souls like his narrator, but by bringing this issue to the forefront by writing this novel, isn’t he asking for just that? Truly, no one needs to continue to read Internet tirades. The delete button is easily accessible. Yet shouldn’t compassion be foremost? Should anyone need to scream into the cybercloud, “I exist! I will prove it to you!”?